I was doing a track program at Northbrook Velodrome. So the Northbrook cycle committee asked me to do a kids Wednesday training program there. I had kids and a few of my neighbors were into it so we started with a small group and I kind of took it over. 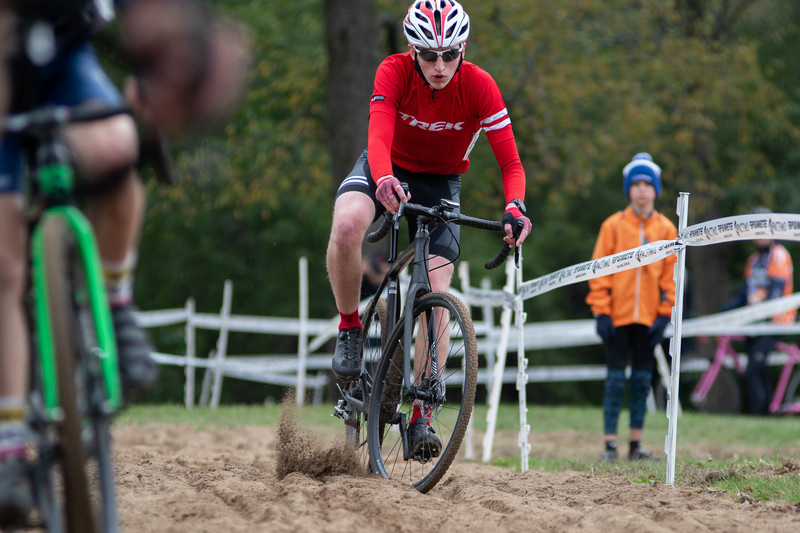 And then my son Peter, went to a cyclocross race. Probably a year before he was eligible, so he was seven or eight. 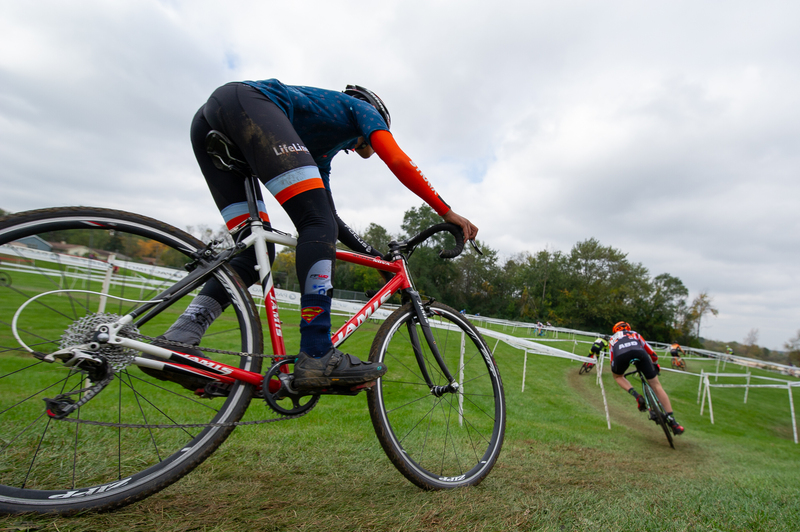 He had a 20-inch Redline bike and in between every race he went out and rode the course. It was actually at Jackson Park. That had to be like 2010 or 2011. I must have been racing then. 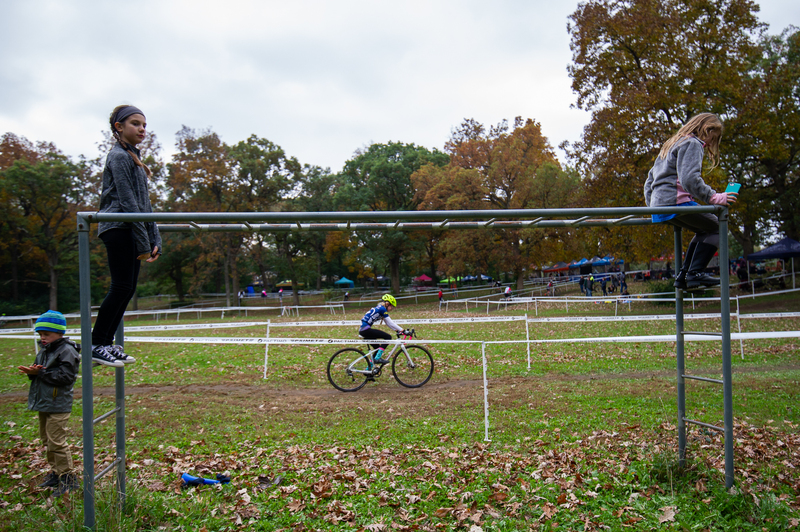 I didn’t set out to do cyclocross. I just did a couple races, just for fun. Then the next year he (Peter) said “Dad, I have an idea. 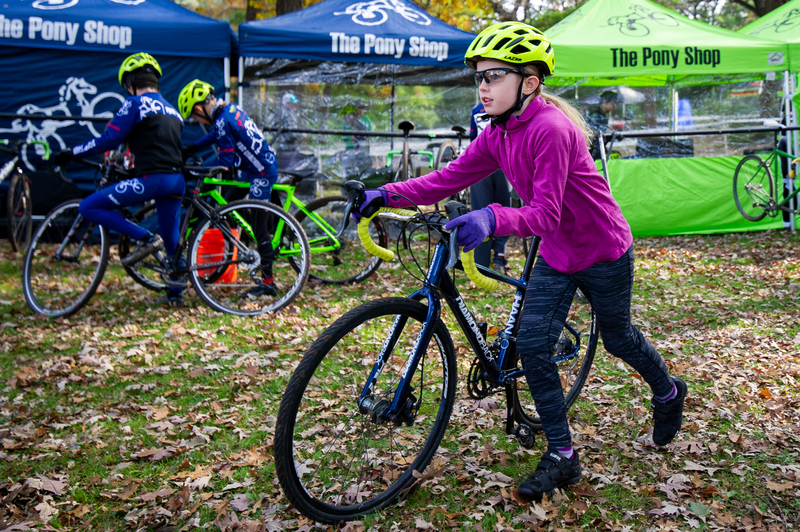 Why don’t we sell coffee at the cyclocross races?” So, of course you’re not allowed to sell stuff at four of the ten or twelve races because they’re in Chicago and you have to get a permit to sell anything in a city park. But I didn’t want to just dash his entrepreneurial spirit and say: “well, there’s a lot of bureaucracy,” like you see these kids getting busted for having lemonade stands without a permit or something… so we ended up buying a tent and setting up at the races and just giving the coffee away. We had decaf too and tea and stuff. Kids would come and hang around the tent because there were sugary drinks around. The following year Lou Kuhn, owner at The Pony Shop, said “why don’t you do a juniors team?” That’s what kicked it off. He said “I’ll buy a bunch of jerseys and give you helmets and tents,” and then I bought tables and other supplies. Another thing is that you underestimate how fearful people are of crashing or falling. The thing about cyclocross is that you fall in the mud and you don’t get hurt. 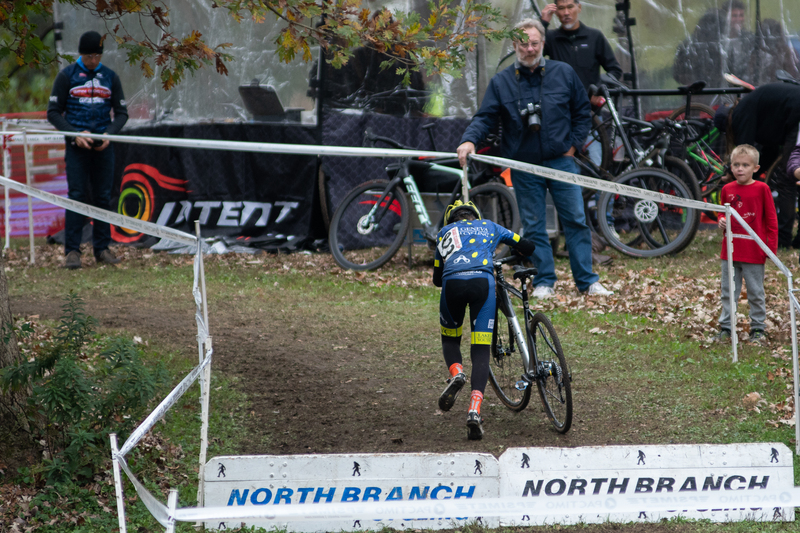 Even mountain biking you hit a tree or something… I fell on Sunday (at Carpentersville CX) and I didn’t even get a scratch on me. I think it’s a great gateway. Another thing is that you can have fun. 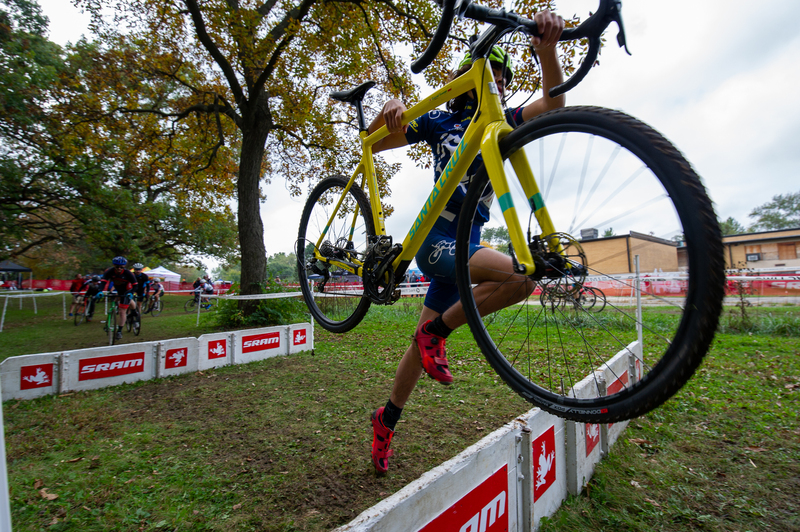 At the Chicago Cross Cup it’s such chaos, nobody really realizes who’s ahead and behind. At the track if you do a 5-lap points race, and there are eight kids in the race, and one of the kids gets dropped… you worry she or he will feel defeated while you’re waiting for him or her to finish. And then even if you’re saying “Hey! Great job!” it’s still kind of like “ugh.” And even if you tell them it doesn’t matter it still feels that way. 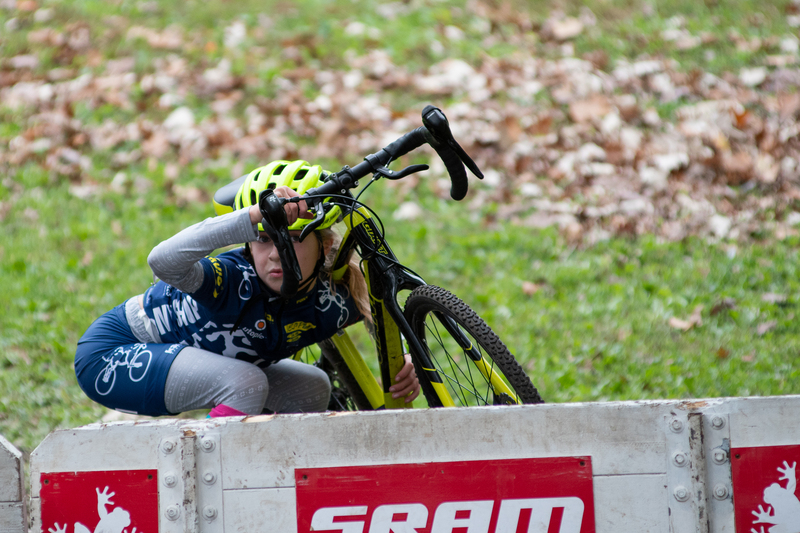 Whereas in cyclocross they’re going around, everyone is cheering. Nobody feels like they are in last because nobosy really knows. It’s a festive atmosphere, you’re racing the few guys next to you. Maybe you do one good run-up or whatever or downhill turn or whatever; overall you can feel satisfied. You’ve got to have a multifaceted relationship with the sport. You can’t just be in the sport because someone told you that you’re good. You can’t think “I hate training but when I get on the podium I love it.” I almost wonder… we try to do a lot of different things for the podium. We do a candy toss and even if you don’t get on the podium you get a bag of gummy bears or whatever. But I wonder if we should even do podiums. I have had kids say to me “I wish I could get on the podium some day.” Maybe we are over-emphasizing the winning. 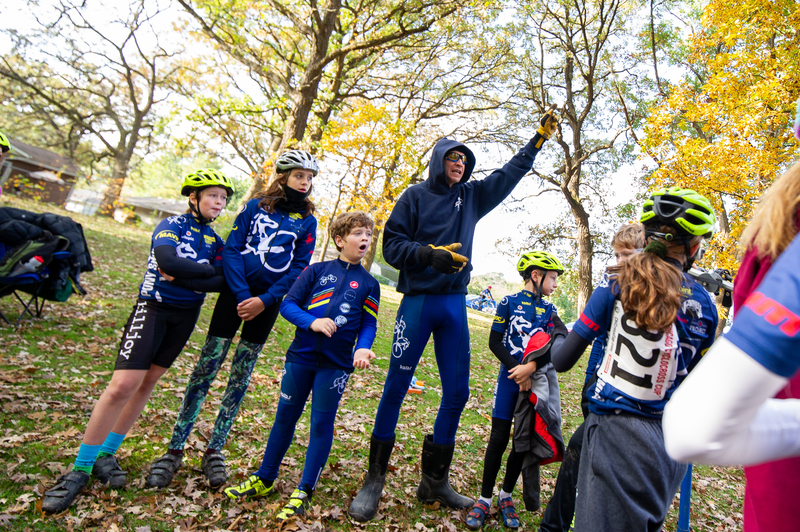 We have practices Tuesday, Wednesday and Friday during the cyclocross season. And another coach, Nick Praznowski, runs a Thursday night practice. Typically most kids don’t go to all the practices. The Tuesdays and Wednesdays are in parks near my house. Thursdays are in a park in Chicago. And then Friday is at Northbrook and since we do the track program there they turn the lights on for us. And then in the winter on Sunday nights, like in February and March, we do calisthenics and gym with a tiny bit of trainer riding in the track chalet building. People want to get out of the house but it’s too cold in Chicago. It’s more getting kids out and active than actual training. We do jump rope, box jumps, lunges, burpees and then they’ll jump on the trainer and ride for 10 minutes. It gets the kids together. We’ll go out for ice cream afterward. We’re trying to get them out, keep them moving and build the connection to the team and to their friends as much as possible. Running the practices is important. There is some strategy to the practice. The Tuesday night practice is more skills and short stuff because the park is smaller. We’ll do starts, we’ll do dismounts, we’ll do sand or rocks or something. At these parks there are little playgrounds with wood chips. It’s good because the wood chips are hard to ride in. They’re going slow but the wood chips are slippery and kids will bump into each other, they slide out. But it’s not too hard, so the good kids can go hard and the little kids can work on handling their bikes. Another thing we do is take two or three kids at a time and we’ll do a figure eight around two trees. So, it’s a super short course and they can try different lines. The kids who are good are racing every turn, bumping into each other, jamming the other guy in a corner with a stop and then accelerating. It becomes an organic experimentation model where they are trying different things. We set up a lot of very short courses, break into small groups and then organically explore different lines at different speeds. We don’t have anybody on a “training program.” I don’t think kids should even be training until they’re 16 or 17. Maybe 15 or 16 for girls. Also it depends on your overall health and well-being. If you’re having trouble in school and you’re getting sick a lot and you’re not doing well in the races, god forbid you should go on a training program. I have no way to prove this, but in my 30 years of observing juniors, it’s not good to train too much, too hard or too structured before like 15 to 17 (years of age). What we’ll never know is if I take a kid who’s 12 and train him really hard and then he goes on and wins Nationals… did we take something away from his future development. We’ll just never know that. 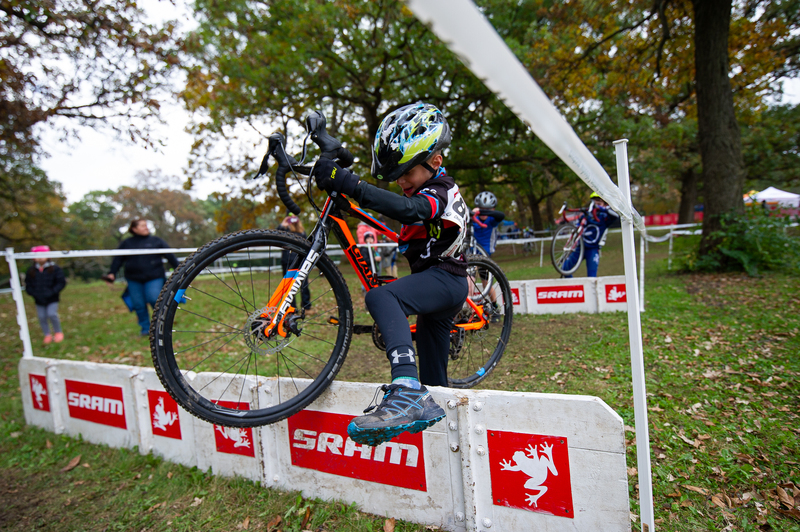 If you can get a kid to the level of a good Cat 3 when he’s 12 he’s gonna be national champ. 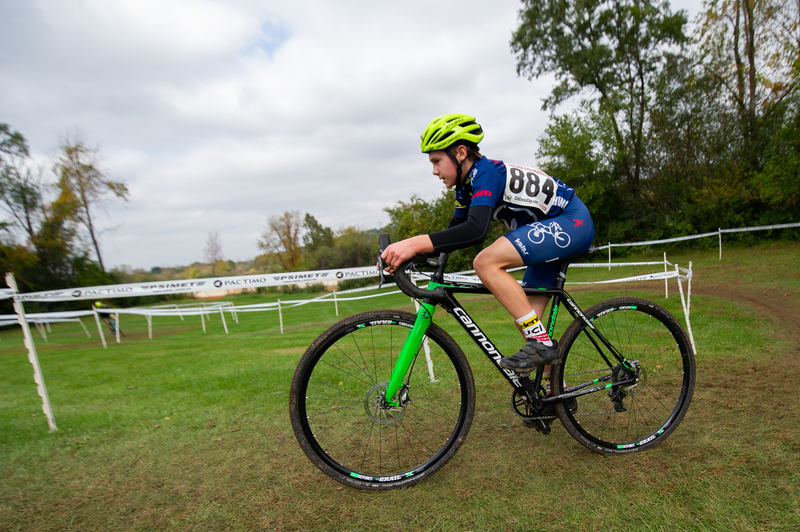 If he’s national champ at 12 or 13 but at 18 he’s still a Cat 3, chances are he’s gonna be disappointed, especially if he or she is in it just because of the positive feedback from adults while the wins were coming. If we can create a scene where kids love it no matter what place they get, the hope is they won’t quit, will be in the sport for life, because there are benefits to that. On Wednesdays we’ll go to a larger park and we’ll a little further and a little longer and we’ll do a little running. So it’s a little more of a training. We’ll have them do harder stuff like a loop around a hilly park. They’ll do 15 minutes around this loop at their own pace. Then we’ll take them to a shorter, off camber loop. And the idea is, “ok, now you’re tired, can you still do the off-cambers.” Sometimes we’ll actually set up tape, set up a tricky corner and have them do it over and over. Or sometimes we’ll set up actual barriers. The idea is a lot of repetition. 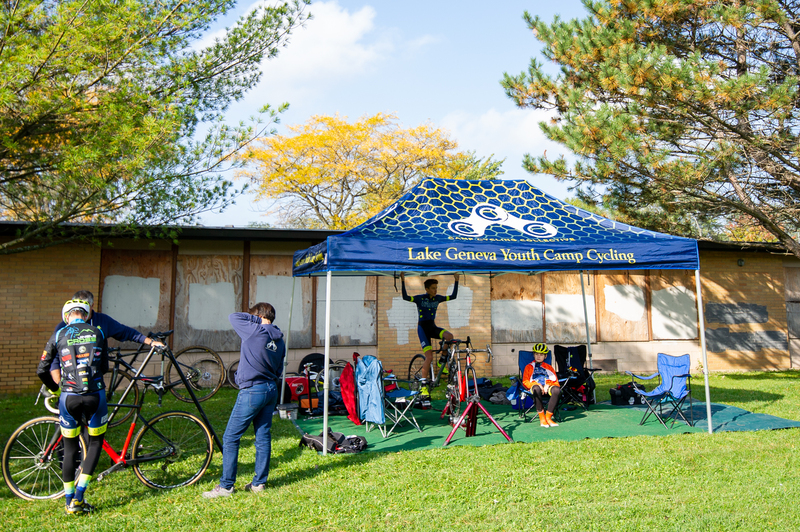 When we first started, there weren’t so many kids at the CCC races, maybe one or two from each of the big teams. 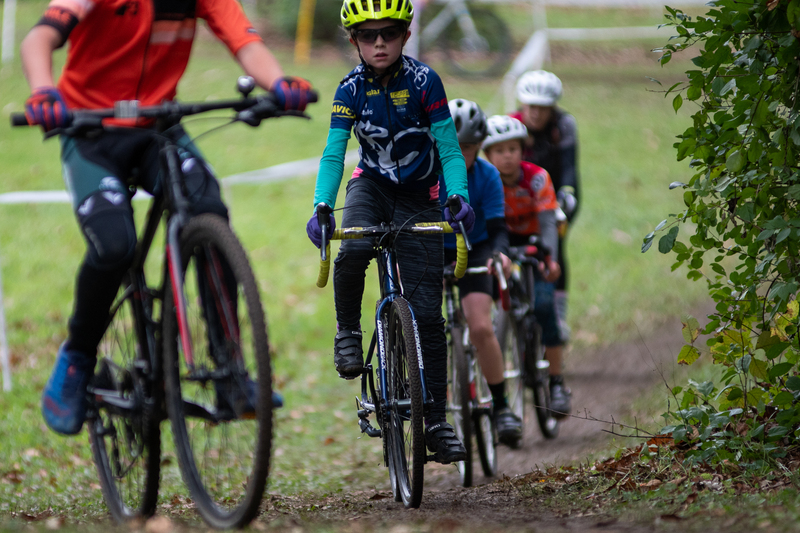 We’ve succeeded in getting kids to go that weren’t normally going to be in cycling. Once you start getting kids to go, families start going. Once families start going, there are more kids hanging around. 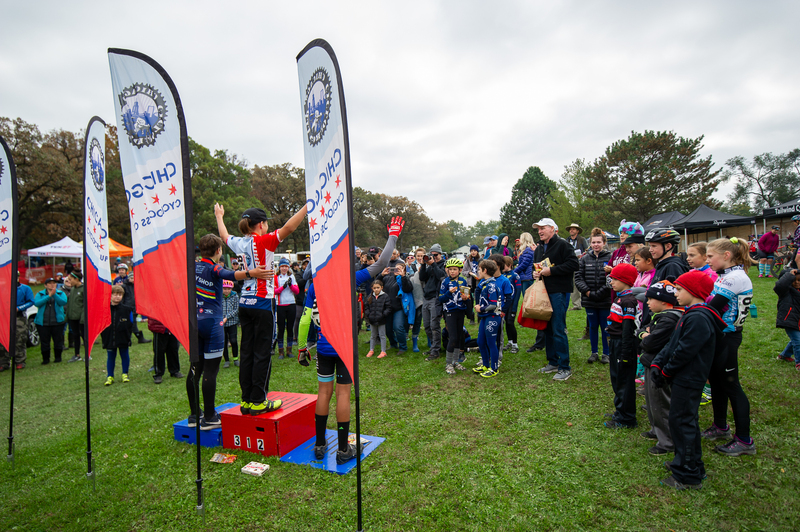 Playing in the woods, cheering grabbing the podium candy. And then there are more people there in general and it starts to feel like a kid-friendly, family-friendly event which to me is hugely important. In the Midwest it feels like the road scene is dying. You go to these events and it’s desolate. (In Europe) most of the small kermesses are circuit races. Kermesse actually translates as something like “town fair.” So, to me, the entry-way into the sport has to be that it’s a little more festive and a little more family-friendly. More of an event to go to and hang out. Kids are highly scheduled these days so we do have people that have hockey in the morning and then they race at 11 and then they have acting class in the afternoon or something. Ultimately we think it would be cool to have a “parents tent” like a party tent. If we had enough money and enough people interested and a big enough team we could cater a party every weekend. I mean, how much money do people spend on tailgating. They just want to be with their friends and be outside and eat food. It is already a tailgate a little bit. If you look on our Facebook page there’s a picture of these girls climbing a tree. Every year a new batch of kids has climbed that tree. Peter (Swinand) climbed that tree, George (Swinand) climbed that tree. Multiple (9-14 CX age) generations have climbed that tree. And watched the race… They’ll stay and watch the race because they’re climbing the tree and the race goes right under tree. How cool is that? One year, (at Carpentersville) there was this hill and the kids were running and rolling down the hill. The other coaches and I had packed up all the stuff and everybody had left already. And the kids were just running and body rolling down this hill. And this was after they had all raced and been outside all day! 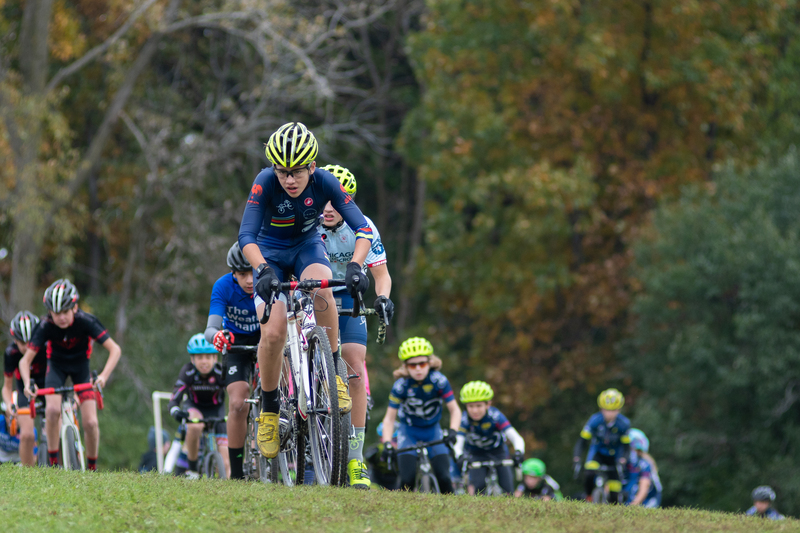 Even if they aren’t competitive anymore in cyclocross, and even if they don’t articulate “remember when we rolled down the hill?” their image of the race is that it’s a huge fun day. Other teams are copying us and so the juniors field is getting bigger because other teams are getting bigger too. Sammy’s has a team now. They’re running practices and buying jersies. If you go to a race and you’re in a tent and you’re the only kid in the tent, you’re gonna go “that wasn’t fun.” On the other hand if you go to a race and you see all your friends you’re like “I can’t wait to see my friends again.” When I was a junior in New Jersey all my friends were my racing friends. I had friends at school too but I was better friends with my racing friends. I couldn’t wait to see my racing friends each weekend. And I’m still in touch with those guys. 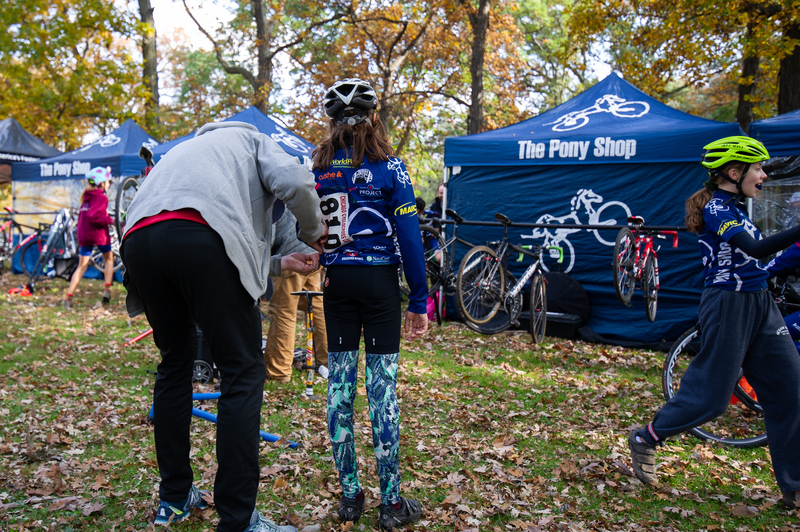 Lou Kuhn and the Pony Shop have always given us good support. Without the tents and without having stuff and people from them I would just be overwhelmed and I wouldn’t be able to do it. Plus they buy stuff for the kids every year, helmets, jerseys. The mechanic we have, Elliott Bennett, we pay him to be there, but he’s a Pony Shop employee. To have that guy is huge. And having the adult team there is huge too. It makes the kids feel like they are being noticed. If Lou wouldn’t show up at six in the morning and set up our tents, we wouldn’t have our space. Lou has a van; if anybody’s bike gets broken he’ll take it back to the shop. Typically, a really little kid doesn’t have a lot of (bike) maintenance. They can’t really break the bike. But then all of a sudden you go from fifty pounds to a hundred, and you fall on that bike, the derailleur’s bent and the wheel’s bent. There’s a lot involved to keep that all in order. A couple courses do a junior cut-off, for the little juniors. So if there’s one particularly difficult section they’ll make the course shorter. Or just make it shorter in general so they get more laps in. I think that’s a great idea. I also think for the Chicago Cross Cup to keep advancing we need harder courses. And then we need a Cat 4 and a junior cut-off. That’s what Beverly just did down on the South Side. Which was huge. It was better for the small juniors. And it was better for the Cat 1s too. 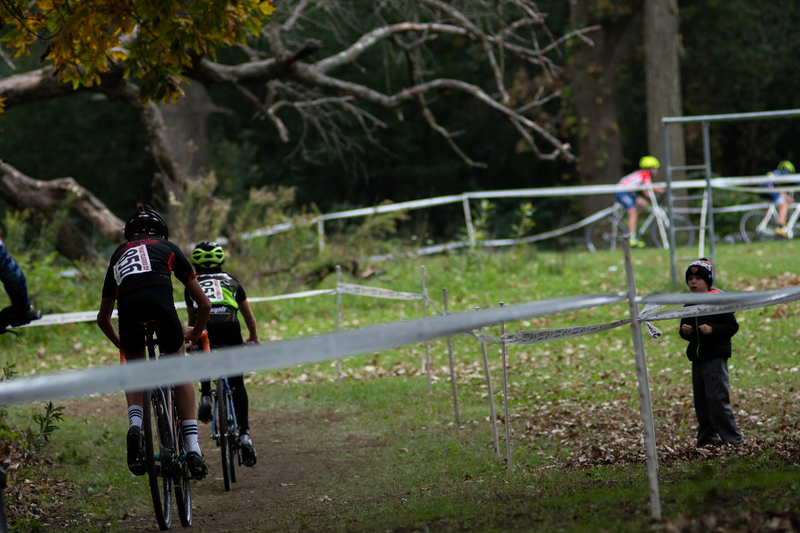 For the Chicago Cross Cup to evolve you need every race to be like Beverly and then you need junior cut-offs. You can’t have them doing the whole thing. It can turn off the smaller or new kids. 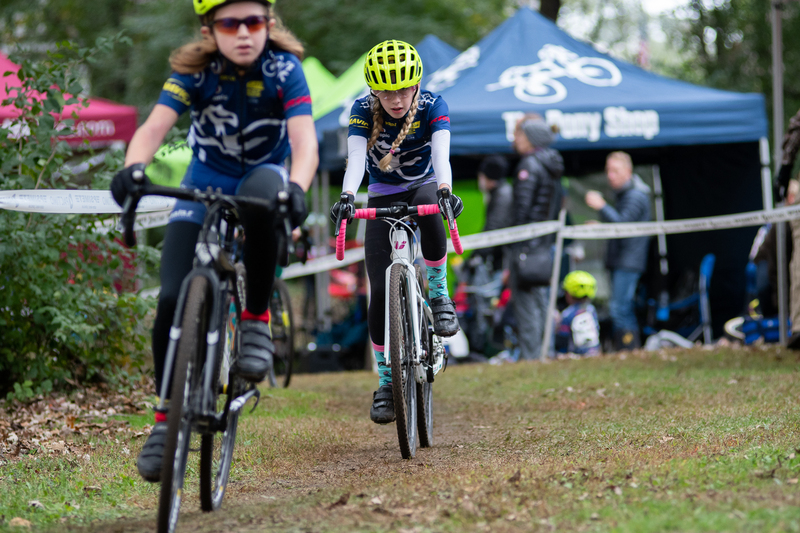 Ultimately, my goal, our aim with all this work is to have kids that stay with the sport and evolve into adults that enjoy cycling in multiple ways. There are so many benefits to being active and outdoors, and it’s a shame but kids and even adults get out less and less these days. Cycling is probably the best life-long sport. 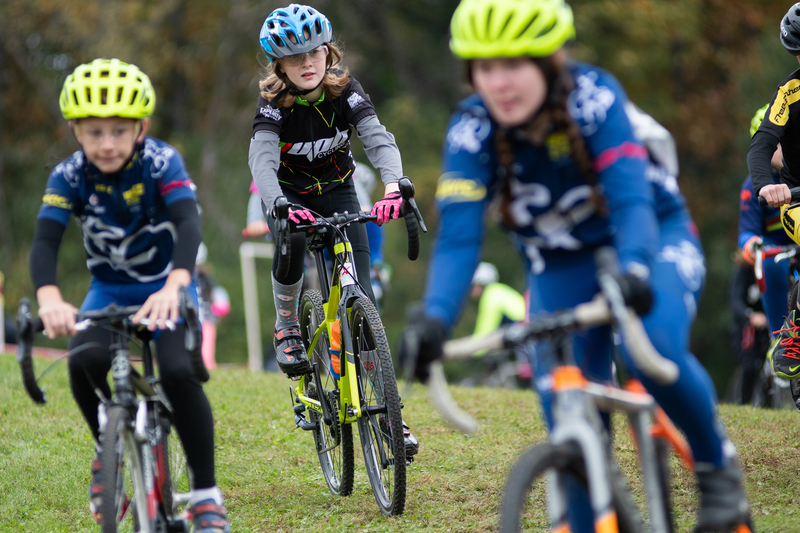 If we can cast a bigger net, expand the understanding and respect of cycling in general, kids will come back when they’re older and have fond memories, take their kids to a race, and a virtuous cycle is born.